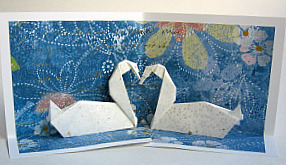 This unique origami pop-up card features a pair of graceful swans with their necks forming a heart-shaped arch. Hana Fubuki Chiyogami, a pearlescent paper with gold flecks. The background is a sparkly piece of coordinating scrapbook cardstock. We used extra pieces of the cardstock to decorate the the outside of the card and the envelope. Inside, the card has two flaps that drop down to form the base. 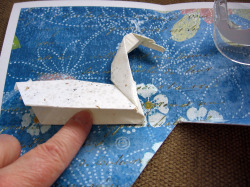 Once you've gathered your materials and made the swans, the card is very easy to assemble. 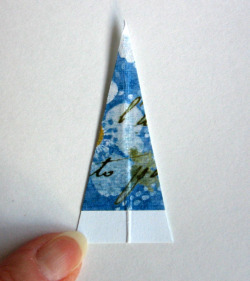 A piece of cardstock to coordinate with your origami paper, cut to 9½ x 6 inches. Save the scraps. 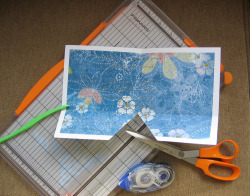 The paper trimmer and creasing tool shown at right made this project a breeze. 1. 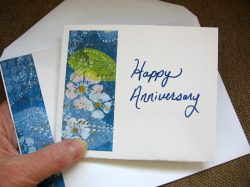 Attach the cardstock to the card using the adhesive. 2. 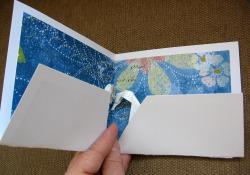 Fold up the base of the card about 2 inches and crease well. 3. Cut a small triangular wedge at the center of the base. Cut it up to the crease that forms the base. This allows the card to close slightly and stand up on its own. 4. Before attaching the swans, close the card and decorate the outside. 5. Important: Before taping the swans to the card, check their positions on the card. 6. Attach the swans with a piece of cellophane tape where indicated by my finger in the photo at right. When placed as shown, the tape acts like a hinge, allowing the swans to drop down into position on the base. 7. Carefully collapse the card and deliver to the lucky recipient of your origami pop-up card. You may need extra postage!